Southwest New Jersey Farmer's Markets: Find a local farmer's market near you in Southwest New Jersey for fruit, vegetables, pumpkins, organic foods,local produce and more! 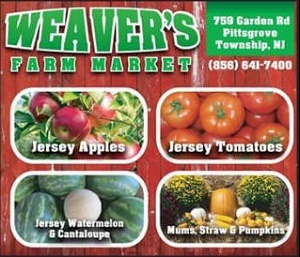 Looking for a local, true farmer's market in Southwest New Jersey? Scroll down this page and you will see the farm markets, farm stands, roadside stands, produce markets, even garden fruit and vegetable stands and seasonal community farmer's markets in Southwest New Jersey, sorted by county. Markets offering organic or sustainably grown produce are identified by the words "organic" and/or "sustainable" in Green, next to their name. If they have a website, the name will be in blue and underlined; click on it and it will open their website. 505 Monmouth Road, Route 537, Wrightstown, NJ. Phone: (609) 758-2068. Fax: (609) 758-0248. Email: Click here for their contact form. Directions: On Rt. 537, between Rt. 528 & Rt. 545. Open: April - December, Daily. Our apple varieties are Braeburn, Crispin, Empire, Fugi, Gala, Golden Delicious, Macoun, McIntosh, Red Delicious, Rome, Stayman. We also have Bedding plants, flowering hanging baskets, nursery stock, ornamental fall items, poinsettias, grave blankets, wreaths. (ADDED: May 18, 2009) (UPDATED: September 11, 2010) Strawberries, peaches, apples, pumpkins - with hay ride to pumpkin patch. Comments from a visitor on September 20, 2011: "My hubby & I took our son a couple years ago to Farmer Jacks for tractor pulled hay ride to pick pumpkins. The man seemed nice at first, but then he started making political comments & we were shocked. Couldn't wait to get out of there! We will never go back there! Don't want to give him any of our business"
92 Georgetown-Chesterfield Road, Chesterfield, NJ. Phone: (609) 298-4374. Email: hlubikfarms@gmail.com. Open: April - October, 8am-7pm. Directions: Rt. 130 or Rt. 206 to Bordentown, Rt. 528 East 4 miles to Chesterfield. Turn right at Georgetown Chesterfield Rd (General Store on right) go 1 mile, farm is on the left. Fresh baked cookies & breads: Blueberry bread, zucchini bread, etc. ; Brown eggs, cut flowers, mums, and bedding plants. Comments from a visitor on October 01, 2012: "My family loves going to this market - lots of variety and choices of venues, from produce, to meat, seafood, bakery bread and pastries. " Downtown, Salem, NJ. Phone: 856-935-8800. Open: held every Thursday in Salem City, NJ during the summer months. Local farmers bring their wares. These include: A.T. Buzby Farms, Battiato's, Bitter Sweet Farms, Gilda's Biscotti, KL Water Ice, Lapp's Dutch Market, Lighthouse Community Garden, Mad Horse Crab Co., Nicolas Culver Garden, Nightclub Eddie's Barbeque, Walnut Grove Perennials, Weber's Candy, Wilson Wool Works.